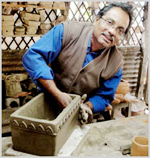 "Last 30 years I have worked with different types of Handicrafts organizations. During this long time relationship, we become friend as we are bonded with each other as an artist. I think that he is a good designer, hard working person and in international market his design has a good demand. I have also worked with Ms Farhana. As a new organization I hope that Twin Trims will achieve their goals soon. We all the artisans will be with Twin Trims." 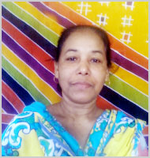 "I am a silk scarf artisans; Mrs. Farhana has created job and better life for me. Ten years ago she arranged training for me through which I learn how I can dye and decorate silk scarf. When I fully understood the procedure I become a silk scarf artisans. I got so many orders. Now, I am a successful silk scarf artisans. Before, I could hardly afford to live in a single room home. Now I live in a house with three rooms. Most importantly, now I can support many other artisans who work with me. Five other families are directly benefited from my sales". "I am a traditional crafts man. I know Mrs. Farhana. We meet each other in handicrafts offices, in the seminar, training program etc. She teaches me how we produce a quality finished product within very short time and utilizing limited resources. Today we are very happy to join the inauguration program of Twin Trims. I wish a bright future for Twin Trims & we all are with Twin Trims". 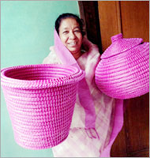 "Mrs. Farhana teaches me a lot about basketry product which have brought so many changes to my life. I am now able to create my own life, and to earn a consistent income. I am so happy to be a part of inauguration program of Twin Trims. 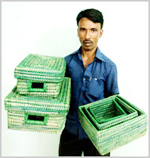 Hope through Twin Trims I will receive good orders and will earn more money than I received before."